This is a list of notable events in music that took place in the year 1927. 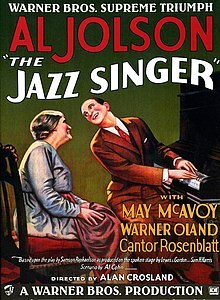 Al Jolson in his hit 1927 sound film, The Jazz Singer. January 8 – Alban Berg's Lyric Suite is premièred in Vienna. April 21 – Electric re-recording of George Gershwin's Rhapsody in Blue by Paul Whiteman's Orchestra directed by Nathaniel Shilkret, with Gershwin at the piano. June – Hamilton Sisters and Fordyce, vocalists, record "My Heart Stood Still" (Rodgers and Hart) and "The Birth of the Blues". July 1 – Béla Bartók's Piano Concerto No. 1 is premiered in Frankfurt, with the composer at the piano and Wilhelm Furtwängler conducting. December 5 – Leoš Janáček's Glagolitic Mass is premiered in Brno. Publishers Chappell & Co withdraw their financial support for the Promenade Concerts, to be replaced by the BBC. Benjamin Britten becomes a pupil of Frank Bridge. Witold Lutosławski enters the Warsaw conservatory. Blind Willie McTell's recording career begins. The Soul Stirrers' recording career begins. Big Bill Broonzy's recording career begins. The Carter Family's recording career begins. Louis Armstrong and His Hot Seven record. Jim Jackson's recording career begins. Hamilton Sisters and Fordyce, harmony trio, tour Variety Theater's with Savoy Havana Band, record with Orpheans, Bert Ambrose, and other's in England June–November. Visit Paris in December. "He Loves and She Loves" w. Ira Gershwin m. George Gershwin. Introduced by Adele Astaire and Allen Kearns in the musical Funny Face. Performed in the 1957 film version by Fred Astaire. "The Rangers' Song" w. Joseph McCarthy m. Harry A. Tierney. Introduced in the musical Rio Rita by J. Harold Murray, Harry Ratcliffe, Donald Douglas and chorus. Performed in the 1929 film version by John Boles and chorus. "Thou Swell" w. Lorenz Hart m. Richard Rodgers. Introduced by William Gaxton and Constance Carpenter in the musical A Connecticut Yankee. Performed in the 1948 film Words and Music by June Allyson and the Blackburn Twins. "Hallelujah" by Nat Shilkret, vocal Franklyn Baur, from "Hit the Deck"
"Maybe" by organist Jessie Crawford, accompanied Nat Shilkret Orchestra, from "Oh, Kay!" "One Alone" by Nat Shilkret, from "The Desert Song"
"Paree" by Nat Shilkret as International Novelty Orchestra; American version of "Ca C'est Paris"
"The Riff Song" by Nat Shilkret, vocal the Revelers, from "The Desert Song"
"The Calinda (Boo-Joom, Boo-Joom, Boo!)" by Paul Whiteman, vocal Jack Fulton, Charles Gaylord, Austin Young and Bing Crosby, from "A La Carte"
Enchanted Isle (Music, Lyrics and Book: Ida H. Chamberlain). Broadway production opened at the Lyric Theatre on September 19 and ran for 32 performances. Starring Marga Waldron and Greek Evans. Just Fancy Broadway production opened at the Casino Theatre on October 11 and ran for 79 performances. Starring Mrs Thomas Whiffen, Peggy O'Neill, Ivy Sawyer, Joseph Santley, Eric Blore and Raymond Hitchcock. Polly of Hollywood Broadway production opened at George M. Cohan's Theatre on February 21 and ran for 24 performances. Starring Midge Miller. Wikimedia Commons has media related to Music in 1927.